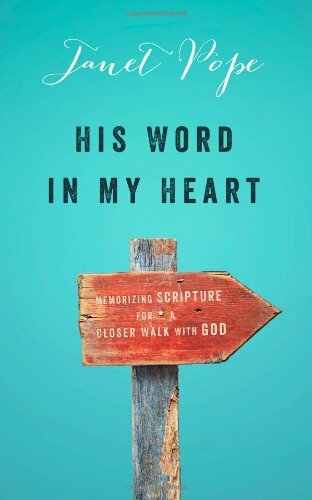 “His Word In My Heart” by Janet Pope is probably some of the most challenging and encouraging reading I have done concerning Scripture memory. Memorizing the Bible is one of those things we all know we should be doing, and yet we all struggle to do it. I have memorized Bible verses very randomly during my life, and sadly remember very little of what I labored to learn. This book presents a different approach. Instead of trying to remember lots of random verses, Pope suggests memorizing passages of Scripture. That sounds really scary, until you actually try it. I have memorized Psalm 1 and Psalm 46 and am working on the book of Titus just in the time I have been reading this book. Learning chunks of Scripture helps you see the context and the flow of thought. This actually makes memorizing easier. Pope gives ample reasons why memorizing is important, gives her own personal testimony regarding Scripture memory, gives lots of tips and suggestions, and then walks the reader through memorizing Psalm 1 and the book of Titus. Pope does not believe Scripture memory is optional, but that it is an essential part of growing in knowledge, renewing your mind, and knowing God in an ever-growing and deeper way. However, she writes in an intensely practical, friendly style. She does not guilt-trip the reader into believing he or she must do yet another thing to gain favor with God or to truly be a godly person. I highly recommend this book to anyone who is interested in Scripture memory, or to anyone who thinks they are not interested or is too scared to try. This book may just get you going on a new adventure, and you will certainly benefit from it! 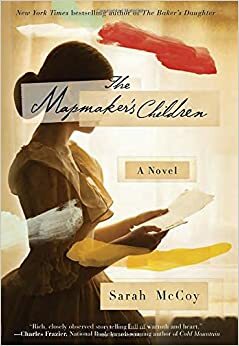 “The Mapmaker’s Children” is a fascinating story that connects two women across 150 years through an historical house. Sarah McCoy uses the physical location of a home to help two women learn who they are and what they each want out of life. Sarah is the daughter of John Brown. She is deeply involved in the abolitionist movement and uses her art to further her cause. She also has strong maternal instincts and finds ways to take care of children throughout her life. Eden is a modern woman struggling with infertility and trying to find her identity. By discovering an old doll in the basement of her historic home, she finds ways to connect with others and bring new meaning to her life and marriage. The book reminds us all that our contributions to life do not need to be conventional or typical. Life has ups and downs, and even deep sorrow, but meaning and joy can still be found. Readers will be fascinated by the historical details, but also wrapped up in the lives of these two women, and will want to continue reading to the end to find the resolution each one finds. I received this book free of charge from Blogging for Books in exchange for my honest opinion. You are currently browsing the Working out Salvation with Fear and Trembling blog archives for August, 2015.